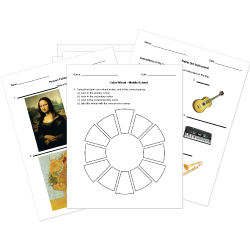 You can create printable tests and worksheets from these Grade 6 Arts questions! Select one or more questions using the checkboxes above each question. Then click the add selected questions to a test button before moving to another page. What are the two gangs that are fighting in WSS? The first boy to be killed in the rumble was . The music to West Side Story was written by Leonard Bernstein . The bottom of the Time Signature tells which note gets one beat. is the number of eighth notes in a whole note. There will be a if the music is over. Tempo is the of music. Which number in the time signature tells you how many beats you have in a measure? The distance between two bar lines. A is two numbers written at the beginning of every staff after the clef sign. A half note gets beats. What note is this in G (treble) clef? Which note gets 2 beats in 4/4 time? E G B D F The notes on the lines of the treble clef. What is the degree of softness or loudness in music?